Hmmm.....I appear to be a little short this week. How about you take the Razzle off, and I just buy the Dazzle? This morning, I am a sad otter. There was a death in my small family last night. It is with deep regret that I must inform you all that my Amazon Fire TV stick has buffered it’s last video. Some of you might think it’s no big deal. It’s just one of several dozen different methods for streaming video, after all. But to me.....to me, it was the magic stick. It hid behind my TV and showed me Netflix, and Prime Video, and Sling TV. It was supposed to sit and work with my Apple TV 2, but it supplanted it. And now...it’s gone. It suffered from a fatal WiFi failure. It had a good life, though. And, it was cheap, after all. I bought it on the day it was announced, so I got it for $25. But now I have to decide if I want to replace it with another Fire TV, or get another Roku. I had the Roku 3 in my bedroom and the Fire TV stick in the living room, but with the passing of little Fire, the Roku is in my living room. I still have an Apple TV 3 in my bedroom. But I can’t get Sling on it. I don’t want to use a Chromecast because, who wants to watch tv by putting it on your computer and then tossing to the TV? Besides, I have Airplay that would do that. So, the big decision is, do I get another Roku, or do I get another Fire TV? And do I go Roku 3, 4 or stick? Or Fire TV, the Stick or the Gaming Edition? I don’t really see the need for 4K yet, so that means the new Fire TV and the Roku 4 can be eliminated. Don’t know if I really want to get another stick, so that knocks off the Roku and Amazon Sticks. After the eliminations, it boils down to the Roku 3 or the Fire TV Gaming edition. I’m thinking I would actually play some of the games they have for the Fire TV. But then, there’s the cost. The current Roku 3 is $91. The Fire TV Gaming is $125. Let me hear your opinions. Heh heh heh.....when you started reading an Oddities post, I bet you never thought you’d be sucked into my streaming media conundrum, eh? Well, no worries. It’s oddity time. The paint style is called Dazzle. And the way it worked was, when viewed from a distance, the paint job broke up the straight lines making it extremely difficult to correctly judge the speed, direction and distance to the ship. It was used to a lesser extent in World War Two, but that is because there was more ariel surveillance, and radar. 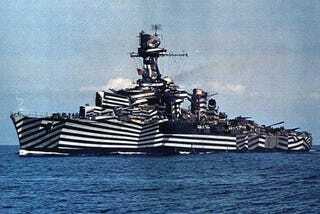 But, Dazzle wasn’t the only way the fighting nations tried to hide their ships. Disguising was a popular method as well. It was common for both the Central Powers and the Allies to disguise merchant raiders as merchant ships. The guns were disguised as cargo. Then, they could either get close to the enemy merchants, or surprise the enemy when they surfaced their sub to blow the merchant out of the water. *Note* Submarines in WWI did most of their fighting on the surface. When they were submerged, they were very slow and not really all that maneuverable. And a torpedo basically drew a line right to you negating the stealthy effect of being under water. They would remain submerged to fight a naval combat vessel, but for sinking merchant ships, they would surface and sink them with their deck guns. They also spent a lot of their cruising time on the surface. That’s why you see older subs with artillery on their decks. Newer subs don’t need them. Besides, a deck gun on the sub makes a lot of noise when submerged. You’d never hide from the sonar if you had a deck gun. In 1914 the British had a ship, the RMS Carmania. They sent it out to disrupt German shipping. So off the Carmania went, heading for the coast of Brazil. While sailing off Brazil, the Carmania did run into a German vessel. It was a converted passenger liner named the SMS Cap Trafalger. A battle ensued and the Trafalger was sunk. If you listen to the stories, you will hear about how the clever British disguised the RMS Carmania by dressing it up to look like a German passenger liner called the SMS Cap Trafalger. But, that’s just not true. However, what is true is, the Germans had disguised the SMS Cap Trafalger by dressing it to look like the British Vessel, the RMS Carmania. The British had no problem deducing the fact that the ship they encountered was a German Raider. After all, it was supposed to be them. I know I’ve told you about a lot of strange things from World War I lately. And I’m not even sorry. In fact, I’m so not sorry that I’m going to add one more quickie. Back in 1913, although they didn’t know it at the time, the deadliest city to live in was Vienna. In that year several people of note were residents. First off was Sigmund Freud. How could Freud contribute to a city being deadly you ask? Well, he was known to prescribe cocaine to his patients. How many died from an exploded heart, OD, or other drug related cause? But Freud was only the tip of the iceberg. You see, also living in Vienna was the Emperor Franz Joseph who led the Austro Hungarian Empire. They were one of the main belligerents in the forthcoming war. His nephew, the Archduke Franz Ferdinand lived there as well. And it was his death that sparked the hostilities. Another resident was Joseph Tito. He was not a nice guy. Although, as far as dictators go, he was actually a fairly decent one. He led Yugoslavia as a communist ‘President for Life’, but he disagreed with Stalin. While he did oppress his people, he rarely had them executed just for disagreeing with the government. He has been called a “Benevolent Dictator”. Also living in Vienna was Leon Trotsky. He was that guy, you remember him right? He was the guy who helped start the revolution in Russia that overthrew the Tsar and resulted in that other guy becoming leader of Russia. What was his name? Oh yeah, Joseph Stalin. Because of his radical communist beliefs, Stalin was in a self-exile in Vienna in 1913. And living just 2 miles from Stalin was his good friend, Adolf Hitler. So, in 1913, these few men who all lived within a 2 mile radius of each other, were responsible for over 80,000,000 dead people.